SYNOPSIS:Halloween has always gone hand-in-hand with horror. The holiday gives many children their first taste of terror, the discovery and overcoming of fears. For those who find they love a good scare, that first taste can grow into a voracious appetite. That might be why you’re looking at this book right now. If so, you’ve come to the right place. 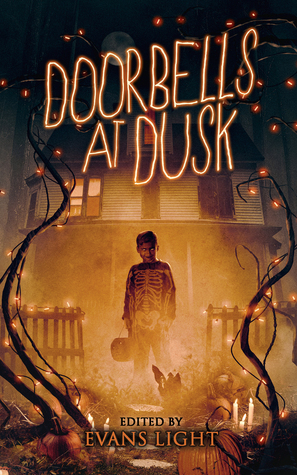 Doorbells at Dusk is a treasury of brand-new Halloween tales from both modern masters and rising stars of dark fiction, horror and suspense. These are the thrills you crave, packed into a collection of stories that’s pure Halloween. Carve your pumpkins and turn on the porch light, Halloween frights begin with the sound of…DOORBELLS AT DUSK. Like most horror fans, it should come as no surprise when I say that Halloween is positively one of my favorite days of the year. It has so much to offer, and given that October is general is my favorite month, Halloween is always the icing on top of the cake of excellence that is October. That said, there’s a shockingly low amount of actual Halloween representation in most of the horror books I read, so when I heard about this anthology full of horror stories taking place on Halloween, I didn’t hesitate. Candy and costumes were all well and good, but Halloween was about that breach between the worlds and the magic which poured in. Let me tell you, this anthology is one of the most fun horror collections I’ve ever read. True to its claim, each story very heavily focuses on Halloween—many of them including costume parties or trick-or-treating as a prominent feature—and this was one of those rare anthologies where I can say I genuinely loved almost every single story. There were two stories in particular that didn’t jive with me as well, but even they were still worth a read! What a twisted way to start things off! We follow a homeowner who’s become convinced that the children seeking candy at his doorstep are foul, wicked creatures. Things get dark quickly, and the unreliable narrative makes it hard to guess who the real villains are here. Every year, one man’s Halloween decorations include a scarecrow that he builds through some shockingly sinister means—what happens when the scarecrow fights back? I’m a sucker for a good revenge story. A gang of burglars spends their Halloween breaking into ritzy homes and making off with anything they can carry, but their night goes very wrong when they find themselves in a house that simply looked too good to be true. Quick, fun gore with a fascinating twist. The house on Summerdale has been abandoned so long that the townsfolk have taken to decorating it for Halloween every year, but their innocent plans screech to a halt when someone discovers the mass graves hiding in the overgrown yard. I’m always taken aback when a horror story can break my heart as solidly as this one did. One man is infamous in his neighborhood for having the most terrifying Halloween decorations anyone’s ever seen. The only thing is… don’t the heads on those spikes seem a little too real? The idea of using brutalized human corpses as decoration is one I’ve seen before, but never done this well. I had so much fun reading Doorbells at Dusk, and I’ve definitely found a few new authors to check out full works from. My favorite thing about reading a good anthology is the way these collections always expand my TBR, and this one was no exception. Whether you’re a long-time horror lover or just someone looking for a spooky Halloween read, I highly recommend picking up this anthology. Thank you so much to Corpus Press for providing me with a review copy in exchange for my honest thoughts! I am freaking obsessed with this cover lol! I don’t know what it is but I just really love the glowing text and the little boy and everything. It is super creepy and fun! I hope you get the chance to check it out. ♥ thank you, Kelly! Oh HECK YES this seems to be everything I want! It was SO GOOD. I honestly loved it.